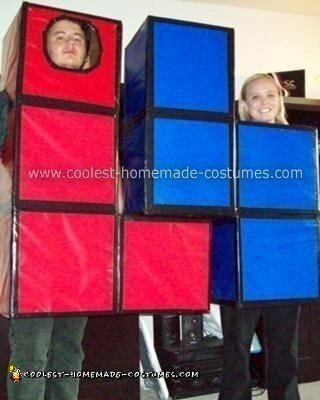 We made some drawings and decided to go for a Homemade Tetris Couple Halloween Costume. We bought 8 16″x16″ boxes, red and blue gift wrap, and black duct tape. The total cost for both costumes was about $25 so totally worth it! We made the costumes in one day; it probably took us about 3 or 4 hours for both of them. The costumes ended up being a huge hit at the downtown Halloween block party; everybody wanted their picture with the Tetris couple! The only things that sucked were that we couldn’t sit down in them (not that there were many places to sit down anyway) and, if we had to use the toilet, we had to completely take off the costumes. Well worth it in my opinion! Unfortunately, they did not fit into the car so we ended up deserting them downtown at the end of the night. I wonder where they ended up? thanks for the idea!!! we won a random costume party!